I wasn’t sure how old the silver tray was. I thought it had been a wedding gift. But yesterday I discovered engraving on the back. June 11, 1971. I had received it as a gift when I completed my Masters Degree. Wow! Must have been from mom and dad. 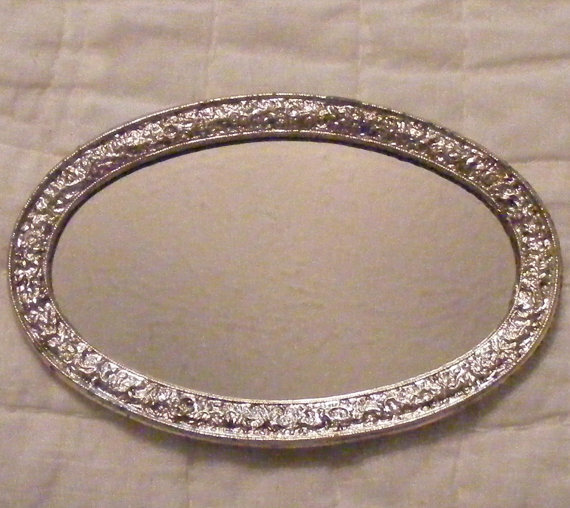 Who else would buy me a silver tray? I’m glad I discovered the date as I want to be accurate when I give it to my now 38 year old daughter. It is the largest tray in the cabinet, so it is always at the bottom of the stack of seven or eight others. For that reason alone, it is seldom used – that and the fact that I rarely have parties large enough to warrant its size and constant cleaning. Yesterday I carefully took each ceramic tray from the pile, being cautious not to let one hit the tile floor or the granite counter top. There is a glass one that I’m pretty sure belonged to my mother – a light peachy pink that is probably Depression glass, but I’m not sure. Mom was like me – she had a lot of “wanna be” treasures. Like my fake Tiffany heart bracelet or my Zirconia diamond ear studs. I should get it appraised some day I guess. Before the kids have the estate sale. Although the “real stuff” of mom’s brought very little cash at my dad’s “house- leaving” sale a few years back. The tray is sitting on the counter, about as black with tarnish as it could possibly be. My daughter mentioned at Thanksgiving that she needed a really large tray. So I’ve decided it’s time to bequeath it to a nice home where it will be used. Today the young women have baking pans that turn into covered and handled carrying trays. They have pans already divided into square-shaped pre-cut brownie sections, and they own fancy decorated pyramid cupcake displays. My hunch is she’ll be like me and pull it out from beneath all the others once every few years when she needs to serve a few dozen appetizers at once. Or, like me, she’ll look at the work involved to clean the danged thing and pull out two ceramic ones instead! Which leads me to today’s task of finding the silver cleaner that is probably at the back of the highest cabinet in the laundry room. This entry was posted in Uncategorized on December 6, 2011 by cwesala.